The Digital Future will have far more impact — the next 25 years will usher more change than in the previous three centuries. What separates great leaders from the rest, is they have a precise vision of the future. A vision to enable change today. Monty's keynote speeches are for those who want to change things and for those who want embrace the opportunities of the Digital Future. 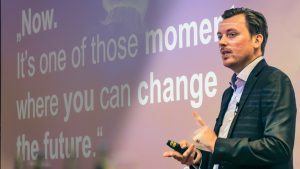 Since over 15 years, futurist keynote speaker Monty Metzger has established a worldwide reputation for identifying emerging technology trends and its impact on business. As an Entrepreneur he understands why technology is disrupting business models, as an Venture Capitalist he is investing in high-growth startups and as a strategic consultant he is helping executives to make the right decisions. He has supported hundreds of clients identify new opportunities and develop successful competitive business strategies based on the creative application of cutting-edge technologies. As an innovative and impactful keynote speaker, Monty will bring this expertise to your audience, blending timely and provocative knowledge with just the right amount of humor and motivation for presentations filled with information you can take away and use immediately to gain a competitive advantage Futurist Keynote Speaker Monty Metzger during Keynote Presentation. Monty Metzger has visited the future and knows where things are going. He had been hired to organize customized trend tours for chairman, high-level management or business owners to the global technology hotspots. In his keynote speeches, he gives deep insights about the business meetings and disruptive technology trends he experienced at its point of origin - Silicon Valley, San Francisco, New York, London, Berlin, Moscow, Tel Aviv, Jerusalem, Seoul, Beijing, Shanghai, Sydney or Tokyo. Monty has worked with members of the board of fortune 500 companies or heads of states delivering powerful insights and helping them to make smarter decisions. Monty has been named as one of the top digital future experts. He has published the book Mobile Future 2020, while his latest book Digital Future will be released 2017. He has delivered over 100 keynote speeches on six continents to audiences from 10 to 5,000. Excerpt of a recent keynote speech at a leadership conference with the focus on the healthcare industry. Technology is shaping the future of health care and Monty Metzger is pointing out the key issues management are struggling. Information Technology (IT) has been changing the health and food industry in the past decades already, but now we have reached a tipping point - a tipping point where everything that can be digitalized will be digitalized. The fourth industrial revolution is redefining the health care industry. In this futurist keynote speech Monty Metzger is talking about the Digital Consumer - how society and consumer behavior is changing, Digital Technologies - the technology trends driving the digital future, Digital Leadership - how CEO and high-level management are coping with the hyper-speed of digital transformation and Digitial Business- how business models and processes are turned upside down. Moonshot Thinking: How to outperform your competition by leveraging disruptive trends? Insights from Monty’s recent trend exploration tours with CEOs to Silicon Valley, Tel Aviv, Seoul and Beijing. Myths, tech trends, social impact and practical knowledge every chairman, vice president, investor or startup founder needs to know. Digital Future: Leadership in times of disruptive and exponential technologies You have to ask the question: What or Who might kill your business? If you investigate and understand your biggest threat you might be able to make change happen and stay ahead of your competition. But your enemy might not be the one you think. Disruptive mega trends, exponential technologies and moonshot thinking are changing your industry before you even aware of it. Learn from thought leaders like Singularity University, investors like Y-Combinator, game changers like Tesla Motors and leading internet companies like Google, Baidu, Twitter, Facebook, Dropbox or Slack at the global technology hotspots. Digital 2030: Exponential Technologies Innovation changing your business, industry and your daily life Technology Trends from USA, Israel, China or Japan are defining our digital future. What is the next big thing? Where do you need to invest your time and money to lead your market in the upcoming years? Virtual Reality, VR Media and VR Entertainment, Augmented and Mixed Reality, Biogenetics, Financial Markets Fintech – BitCoin and Blockchain, Autonomous Vehicles and Self Driving Cars, Energy Innovation – Solar, Battery or Smart Storage, Healthcare Innovation – Healthtech, Digital Business Models – OnDemand Society, Multi-Planetary Life, 3D Printing and Home Production and many other tech mega trends. 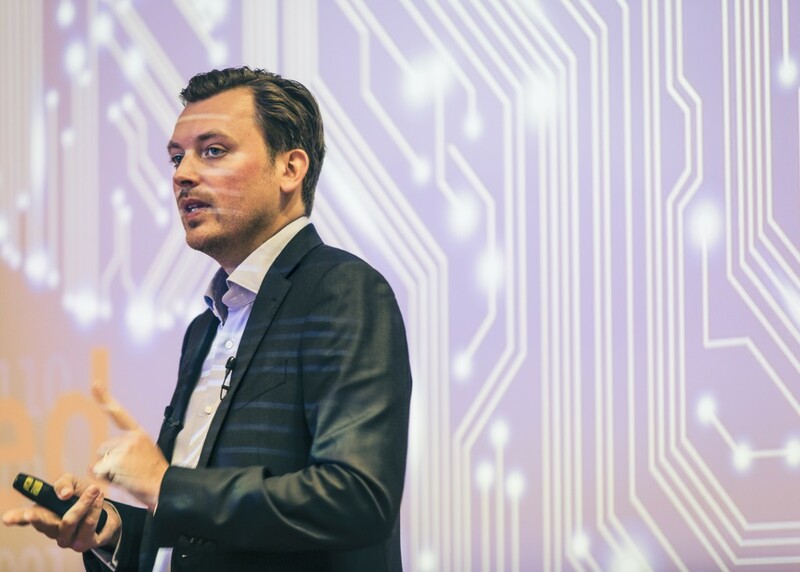 Recent keynote speech about digital disruption in the manufacturing and its impact to leadership and management. Monty’s presentation uses a heavy amount of images and video, all embedded into his Keynote deck. Monty’s presentation is anamorphic, and can display in either 4:3 or 16:9. Monty doesn’t require a lectern, and we recommend you keep the stage as clear as possible for him to move around.